It is often the case that when converting the loft the existing boiler will need to be replaced. The reasons for this is quite simple. Adding new radiators or possibly showers in en-suite bathrooms in the loft means that old heating systems will be overwhelmed and unable to cope with the new demands placed upon it. That being said, if your heating system is relatively new you shouldn’t have any problems, probably over half of the loft conversions carried out in the UK don’t need new boilers. However, it can be very cost effective and practical to incorporate a new heating system when converting the loft. Boilers tend to last around twenty years before they need to be replaced and if your present one is over ten years old then it would be definitely worthwhile thinking about upgrading the boiler when you carry out the loft conversion. Installing a new boiler and upgrading the heating system is carried out during the first fix plumbing stage. Any work must be done by fitters who are on the Gas Safe Register. The GSR replaced the old GORGI scheme but the principles are the same. 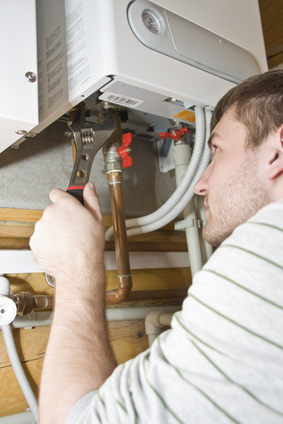 Only qualified tradesmen are allowed to work on boilers and heating systems. For those building a DIY loft conversion this element of the work must be turned over to the professionals. A loft conversion is a perfect opportunity to upgrade your old boiler and most home owners will find that the best type of unit to use is a combination boiler. This type of boiler is rapidly becoming very popular and is probably the best selling type of boiler in the UK today. There are many advantages that combination boilers have over the other types of boiler. They are very efficient and robust and will easily cope with extra radiators. A combination boiler will also supply hot water instantly and in any quantity needed; you will never need to wait for the water tank to fill up. The reason for this is that separate tanks are not required and though a combination boiler is larger than other type it is well worth the effort to fit one into your plans. Probably the biggest drawback with this type of boiler is its price. They are significantly more expensive than other boilers but this expense is recouped by the ease in which they are installed and that they don’t require extra tanks or plumbing. A combination boiler is highly recommended for your new loft conversion.